by Dave from The Longest Way Home ~ November 5th, 2012. Updated on May 30th, 2017. 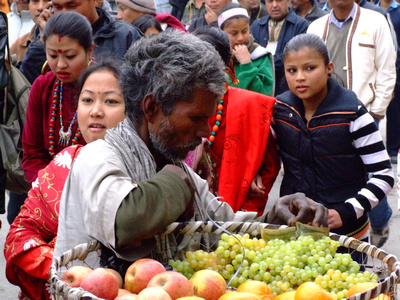 Published in: Travel blog » Discover World Culture » Nepal. Today there is still a very active caste system in Nepal. 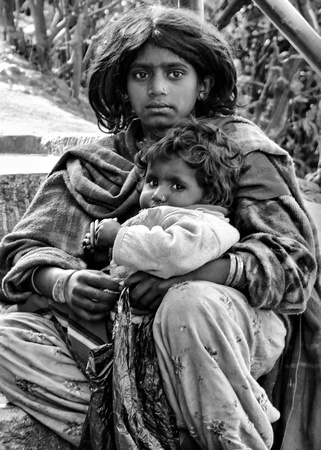 Primarily associated with India, caste systems in one form or another are evident the world over. The difference with Nepal is that the ideals behind the caste system were made illegal in 1962. After a decade long civil war, a fallen monarchy, a fledgling democracy which still hasn’t been able to form a legal constitution since 2005 and a disastrous fractured political system Nepal’s caste system continues to influence everyday life in Nepal. The global definition of the caste system surrounds a classification of several hereditary groups of hierarchical social class. However given the global nature of the “caste system” it has in part become fragmented into slightly different meanings depending on the culture it’s embedded into. Thus making is a complex system that can combine many elements from birth right, ethnicity, occupation, power and financial acumen. Depending on your families hereditary line including their wealth, power, influence, occupation, ethnicity, education and name you will be placed into a group within society that will determine your future job, income, education, lifestyle, social standing and influence including that of your offspring. Based on words from Prithvi Narayan (founder of the Shah dynasty) there are 4 Varnas (main groups) and 36 castes in Nepal. Influenced by Hindu caste systems and originating from Indo-Aryans. Mix all that with 103 distinct groups speaking 92 languages and it becomes vastly complicated in Nepal which unfortunately in turn gives power to certain influential people today. However the basics of it are as follows. Sudra – laborers, artisans and service providers. There are then 36 castes within Nepal. Including the Dalits or “the untouchables” or in Newari “from whom water cannot be taken” – one should never touch someone of the lowest caste after all. The irony here is that within the Dalit are Dhobis who wash clothes with their hands that the higher castes will then wear. Many people’s “caste” can be identified by their surname. eg. Mr. Madu Bhusal can be identified by his surname as being a Brahmin. None of this is simple to “class” or understand though as there is a lack of clarity on the “definition of Dalit” for example which obviously means diversity in data. And that’s just on one caste! Technically ones caste shouldn’t have any influence on your standing in Nepal today. People of any “caste” or religion or ethnicity etc can attend any school or apply for any job etc. The problem is the reality on the ground tells a different story as discrimination and appraisals are often still based on caste. Even if such inference is not openly admitted. A 1991 census reported 96,977 persons having educational attainment of graduate and above level. Of these, only 3,034 or 3.1 % belonged to Dalit castes. Dalit make up for 20% of the population (source). Whenever I mention I’ve made a new Nepali friend in an ethnically diverse Nepali population like the one in Kathmandu another longer term friend will ask what the new friends name is. Based on the surname alone my older friend will know my new friends caste and status. If it’s a conflicting caste to theirs there’s often a follow-up frown or nod of approval. Younger Nepali are not so quick to judge though. Things will and are changing as they do for many things based on the moving of generations through societies pivotal roles. There are also several organisations within castes that try to help those facing discrimination due to caste. Sanskritization has also taken place where by some Dalits have taken the customs and traditions of higher castes on as their own. And in doing so have move up in caste themselves. While many may read the above and wonder why anyone would want a caste system you might be surprised to learn that many people actually feel comfortable with it. Or at least have become so comfortable with it that they are used to it. Take a Mr. Ranpal a Nepali rice farmer of the Vaishya varna or caste. He grows and sells rice for the markets as have his family for as long as they can remember. They are known and respected for what they do within the caste system. Mr. Ranpal may be called upon by someone from a Brahmin or Kshatriya caste to provide crops for their business. Mr Ranpal knows where he stands in Nepalese society. Even without work he will never be asked to sweep a road, clean a toilet, or bake bricks. He will be asked to farm. With little education other than tilling the land for centuries Mr. Ranpal is a respected man of knowledge. He has security and pride in being Vaishya. If any wrong is ever done to him there are several groups that represent his caste who will protect him. If a merchant he is supplying rice to refuses to pay him then other members of Mr Rampal’s caste may refuse to supply the merchant with rice. So the merchant will have nothing to sell. That is until he pays Mr Ranpal what he is owed. For some belonging to caste is much like a workers union. There is strength in numbers so long as you know your role. Traditionally within the caste system Mr Ranpal and other of “lower” castes would never have been able to do things people of a higher caste could do.The Dalit caste were not allowed from entering certain temples, enrolling children in schools, attend certain festivals, walk on the same road as a member of higher caste, court or even look at a woman of a higher caste. Breaking such caste dictates would result in punishment by death, fines, removal from their caste (demotion), or imprisonment. Today such punishments are illegal by way of legislation. However if you think about how this has been instilled into people for generations and the lack of nationwide education in Nepal today. You might guess correctly that the caste system is still in place. Think about the generations of wealth Kshatriya or Brahmins have built up over the centuries. Much like in western societies where they say “the rich get richer and the poor get poorer” holds true in Nepal as it maintains the inherited ghosts of a caste system. During my time in Nepal I’ve got to know quite a few local people of different castes. Some of my friends still shock me when I want to invite a laborer over to our dinner table rather than see him sit alone. I’ve often been told “he’s just a builder”. Or they mention his tribe or caste. The laborer is often times highly embarrassed and I nearly have to force them to sit at our table. He worked for you today. We are eating. Let us eat together. A friend told me later that night that I’d insulted one the men at the table by letting a laborer sit with us. With attitudes and beliefs like that is it no wonder that Nepal’s politicians never seen to change. There’s a caste system in place there too. It’s always the same old people under the revolving door of different party names. None of whom can even form a constitution. The people of a higher caste and an older generation don’t want to let go of a system that gives them power over others. The solution is coming in the form of the new Nepali generations that have exposure to international media and news. Already the caste mentality is eroding into one of a western approach. Unfortunately that’s often one that revolves around a social hierarchy based on wealth. But at least one has a better chance at breaking out of poverty than being forced into it by caste. What remains now that the Nepali caste system is eroding away; is the opportunity to lay the ghosts of the Nepalese caste culture to rest as well. 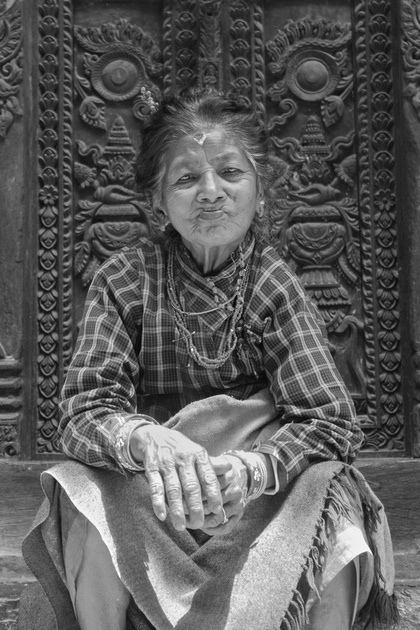 I love your Old lady from Bhaktapur photo. Stunning! Amazing piece of work here, Dave. It’s always great to read something that shows the other side of an issue that I did not previously know about. I’ve been meaning to write that for a while. Generally I don’t see most people taking a huge interest in it. But in terms of global observations it’s interesting to me in terms of documenting it. Much like the great work you’re doing in China. Hopefully it will be of interest to others who long-stay or go to volunteer or learn more about the cultures. Very insightful piece. I never new there was this much going on in the world. Thank you. Could have read this on National Geographic, fascinating! I couldn’t imagine living in a society like that. But as you wrote there’s something similar over here too. People do judge you on your name (Nationality) and of course job status. Good points about being judged internationally on nationality and job status. There’s always a strange look when traveling and sitting at a table with a doctor, a bricklayer and a cook. This is a terrific article – well researched and well written. It was a pleasure to read. One of the most interesting reads I’ve had in a while. Strange to read about being born into a caste, interesting to read about those happy with it! It’s almost like a union you are born into! As an old hat in Nepal this is one of reads I’ve come across by a traveller in some time. Well done. Once every generation we see the shackles society remove from this caste way of life. It’s replaced by a society that values it’s people based on wealth alone. Agreed. Hopefully the new generations after the “wealth” generation offer something better. Interesting article, however I think you might have missed the intersections between ‘caste’ and ‘wealth’. I am married to a Nepali man (and from my name you can see he is from Brahmin caste)but he grew up in a poor family. Indeed his sisters had arranged marriages to men from Kshatriya (mainly Rana/Ranabhat) families as their Brahmin caste gave kudos and the Kshatriya families could guarantee a much more comfortable life. There are at least as many poor Brahmins as there are rich in Nepal, the same goes for many of the castes & ethnic groups. I do see more of a willingness for Nepalis to have a mixed marriage with a foreigner than with a different ethnic groups within Nepal, which is odd but apparent. It’s encouraging to see many Nepali friends who basically don’t give a damn about ‘caste’ and I am optimistic. In centuries past English surnames were a kind of caste system but they still give a clue as to a family’s origins (eg, Prime Minister ‘Thatcher’). But until Rai marries Sharma and Pun marries K.C. Nepal will always have a meaningful system of discrimination – I hope the youngest generation there will show the way. While reading your article I was wondering about some things. As a foreigner are you allowed to make relationship and friendship with people of all the castes? If I understood it correctly it is ok as far as you don’t attend to force people of two different castes to each other. Does this system still have an impact on marriages? Is it possible for a couple from different castes to get married? And what about foreigners? I’ve read your other article about living in Nepal so I know that it is possible/allowed to get married to a foreigner, but I still don’t understand whether they have to be aware of the casts? Yes as a foreigner you are allowed to have a relationship or friendship with any caste. As a Nepali technically and legally this is also true. In practice however, especially among the older generations or those who still believe in the caste system, it’s more difficult. Especially a higher caste marrying a lower caste. As this would be seen as bringing shame on a family. Again technically and legally there’s no law preventing different castes from getting married. In reality it’s not that often you would see a lower caste man marrying a higher caste woman. As there’s no law that prevents who you marry yes a foreigner can marry someone from any caste. In a strange way if a foreigner married someone from a lower caste it would probably elevate them somewhat in the caste hierarchy. So long as the foreigner had money, influence etc. However, it depends upon the family. You will be a disgrace to the family and the house if you fall in love with someone from other caste, except for some educated families inside Kathmandu. Laws have been made. But it shall take a long time to change people’s mindset. I am from Nepal and I personally have been a sheer victim of caste system. I recently had to give up on my 4 year old relationship with my classmate girlfriend as she was from a Newar background. I had almost convinced my family however her family and relatives were too strict on her. She couldn’t just move in with me because she didn’t want her mom and her family to get hurt and the society is too wrong. I know, caste system have had worse impact on society than this but that’s the exact reason why I hate this with my life. Hello. I am Esteban, from Mexico. Winner of the last year national prize for children’s literature in Mexico. I am in Nepal now doing some research as the novel I am preparing now has to do with the left overs of cast system here and the weakness of the government when assuring equality. You article has helped, and also the very new comments below. Thanks.